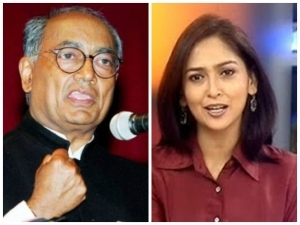 Congress general secretary Digvijaya Singh on Wednesday admitted to his relationship with Rajya Sabha TV anchor Amrita Rai. Some intimate photos showing the former Madhya Pradesh chief minister and the TV journalist were leaked on the Internet and went viral. Singh tweeted on Wednesday, “I have no hesitation in accepting my relationship with Amrita Rai. She and her husband have already filed a mutual consent divorce case”. Meanwhile, Rai had alleged that her computer had been hacked. She tweeted, “I have separated from my husband and we have filed a mutual consent divorce papers. After which I have decided to marry with Digvijaya Singh”. @SirJadeja: That awkward moment when you realise even Digvijay Singh has a girlfriend but you don't. @suhelseth: What diet are the Congress old fogeys on? Diggy, ND TIWARI and so on? They should be on India's Old have Talent!, and, 'Karan JOHAR announces: Diggiwale Dulhaniya Le Gaye Hain'. @lindsaypereira: Must give credit to #DigVijaySingh and Amrita Rai for admitting to a relationship. Others refuse to acknowledge their wives for decades.